Pampanga Representative Gloria Macapagal-Arroyo takes her oath as Speaker of the House just minutes before Duterte's SONA. Philstar.com/ AJ Bolando. Minutes before President Rodrigo Duterte’s State of the Nation Address, a political tug-of-war for the speakership of the House of Representatives took place between Davao del Norte Representative Pantaleon Alvarez and Pampanga Representative Gloria Macapagal-Arroyo. The dramatic events, which delayed the speech for about an hour, unfolded on live television but without an audio feed — leaving many Filipinos confused as to what was happening. 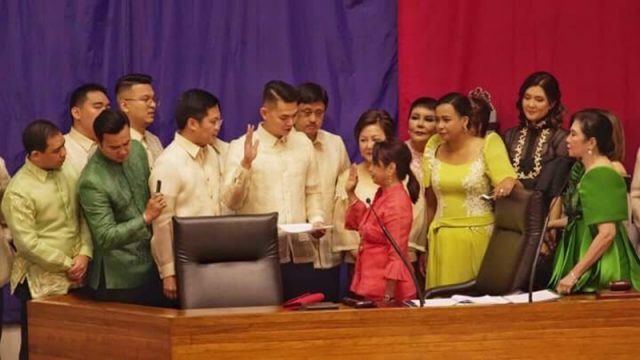 Arroyo took her oath as Speaker of the House but it was Alvarez, a long-time ally and close personal friend of Duterte, who welcomed the chief executive into the Batasang Pambansa Complex. They cited that it’s “nothing new” in the Philippine government and referred to it as a plunderer “taking over” from another plunderer. Both Arroyo and Alvarez have faced plunder charges before. The Liberal Party’s official Twitter account observed that the division among government officials are not caused by opposition members. It said that the division stems from Duterte’s supposed allies. The tweet was later deleted. The Liberal Party and its supporters have long been accused of causing division within government officials who are mostly members of the PDP-Laban party. Previously, Senator Antonio “Sonny” Trillanes IV revealed that the opposition has already “consolidated” and “united” its ranks as a stronger force. Robredo has already declared her willingness to be the new face of the united opposition.